The Oregon offense certainly doesn’t lack weapons, boasting the Heisman winner Marcus Mariota, Pac-12 offensive freshman of the year Royce Freeman and running back turned slot receiver Byron Marshall. As if Mariota and the offense needed any more help, redshirt freshman wide receiver Darren Carrington has become yet another factor that Ohio State will have to contend with. Chantel Jennings of ESPN.com shed some light on what has made Carrington come alive in recent weeks. Playing college football requires tremendous athleticism, something that Carrington showed he has in spades. In high school he not only played wide receiver but also cornerback, safety, quarterback, outside linebacker, returner and occasionally long snapper. 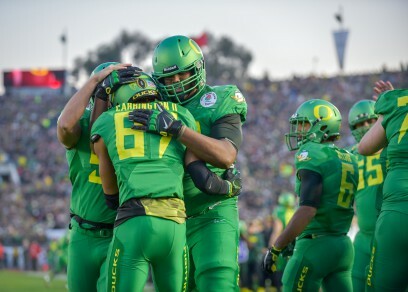 Carrington’s experience on every inch of the field has begun to pay off for the Ducks. Carrington will be one more weapon for Mariota and another challenge for the Buckeyes. For most of the season Carrington did not have a chance to show his skills. On the depth chart at wide receiver he was behind players such as Keanon Lowe, Dwayne Stanford, Devon Allen and another outstanding freshman in Charles Nelson. However, even without recording a reception in four games this season, Carrington has 704 yards, behind only Marshall with 834. While he may have not recorded a touchdown until November 1 against Stanford, or a 100-yard game until the Pac-12 Championship against Arizona, Carrington is beginning to come into his own. In that game against Arizona Carrington averaged 18 yards per reception to help put the Wildcats away with 126 yards and a touchdown. 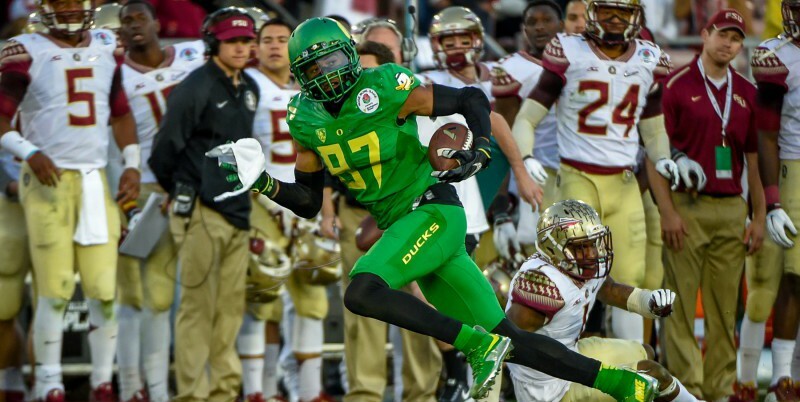 His skills were on display once again last Thursday in the Rose Bowl when he hauled in seven catches for 165 yards (the most by an Oregon receiver this season) and two touchdowns. A late season surge is exactly what Oregon needed after Allen went down with a knee injury on the opening kick-off of the Rose Bowl. It may have taken some time for the redshirt freshman to find his groove in the offense but now that he has started, he looks unstoppable. This season Mariota is averaging 294 passing yards per game, the best quarterback in college football plus another weapon could spell bad news for the Buckeyes in Dallas.